A real apostille seal and ribbon in South Africa, embossed. How does an apostille work? 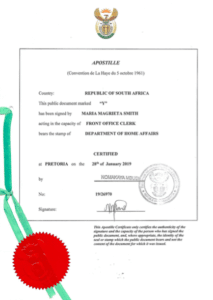 Before obtaining an Apostille Certificate for South African documents, you’ll need to verify that the country that will be receiving the document is a signatory to the Apostille Convention (Convention de La Haye du 5 Octobre 1961). A document issued in South Africa often has to be apostilled or legalised when it is going to be used in a foreign country. South Africa is a member country of the Hague Convention “Abolishing the Requirement of Consular Legalisation for Foreign Public Documents of 1961”, and as such, an Apostille Certificate is often required before legal SA documents may be used abroad. Under this Convention, member countries agree to facilitate the exchange and verification of documents; an apostille certification will be required for all member countries of the Hague Convention. PLEASE NOTE: It is up to each and every person to find out whether they require an apostille or authentication on their document. We cannot officially advise you on this point. Only the authority you are submitting to can advise you. All the “other” document above first have to be notarised, then apostilled at the High Court. What does an apostille from South Africa look like? An apostille is an extra page (this is important to note if you need translations done as they charge per page) that is bound to your original document (e.g. 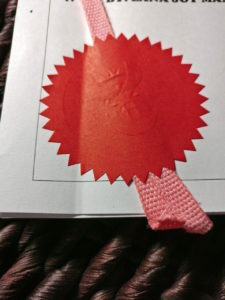 birth certificate) stating that the person issuing and/or signing the document is legitimate, as well as the stamp thereupon. Do I have to notarise and apostille my documents? In some cases, official South African documents will have to be notarised before Apostille. If the country where you intend to use the document is also a member of the Hague Convention, the document can be certified by apostille. For the foreign country to accept the South African document as valid, proof must be made that the signatures and the document are legitimate, which is why there is an authentication process. Depending on whether or not the country where the document will be used is a member of the Hague Convention will determine the type of certificate required. What if the country does not belong to the Apostille Convention? Because not all signatures and documents used in South Africa are known to all other foreign countries, the apostille process is used as an authenticity indicator. Consular notarial services are rendered to South African citizens that require South African official (public) documents to be legalized for use overseas. When documents receive apostille certification, they have legal validity to be used outside of the Republic of South Africa. Whenever documents are legalised, it means that they have been executed within the Republic for use outside of the Republic. They are affixed, sealed, and signed either with an Apostille Certificate (if the country it is intended to be used in is a member of the Hague Convention) or with a Certificate of Authentication (if the country where the document will be used is not a member of the Hague Convention). Read more about this embassy authentication (sometimes referred to as attestation). Chinese embassy attestation is covered here. You could have your official South African documents legalised abroad by a South African diplomatic or consular representative only if the documents were legalised by the relevant foreign competent authority in their country of accreditation, for use within South Africa. 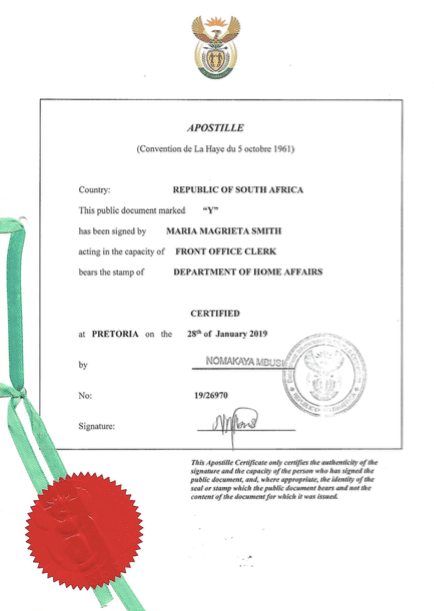 South African diplomatic or consular representatives abroad are not permitted to issue Apostille Certificates, only Certificates of Authentication. What does an apostille service cost? See the table below to get an idea of the pricing for apostille for the various possible documents. Please verify these prices with our main pricing page in case there have been recent changes. Let us assist you, we are fast! Apostille certification, therefore, refers to the process followed by which the signature and seal on an official (public) document is verified. We can handle all such apostilles and in record timing. See our pricing.